Other Reports Table of Contents Mechatronics, A Technology Forecast Complimentary! Home Technology Integration, A Technology Forecast Complimentary! Biotechnology: A Guide to Business and Workplace Development Emerging Technology Programs: Advanced Digital Manufacturing Homeland Security, A Technology Forecast Complimentary! Fuel Cells, A Technology Forecast Complimentary! Nanotechnology: A Technology Forecast Complimentary! Programs for Emerging Technologies Complimentary! White Papers, Articles, and Complimentary Reports Complimentary! TFI publishes in-depth research reports and papers providing analyses and forecasts of emerging technologies and markets. These reports and papers are written for decision-makers looking for the competitive edge in specific technology and market areas. Topics include many of the non-traditional telephony products and services from the broadcast, cable, computer, satellite, and wireless industries. Many of the publications are sponsored by the Telecommunications Technology Forecasting Group, a consortium of telephone companies comprised of AT&T, CenturyLink, and Verizon. This report presents the latest TFI forecasts covering switching, circuit equipment, metallic cable, and fiber cable. The report also includes TFI's latest recommendations on depreciation lives for local exchange telephone plant, focusing on legacy assets. The recommendations take into account technology displacement and loss of access lines due to competition. Sponsored by TTFG, a consortium made up of AT&T, CenturyLink, and Verizon. 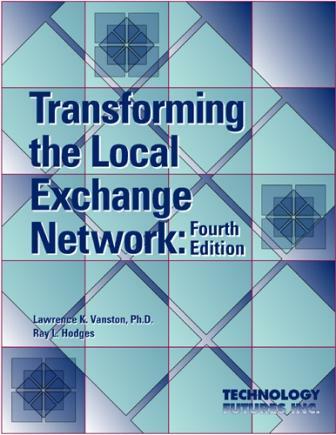 The fifth edition of TFI"s flagship publication Transforming the Local Exchange Network is available for release on October 11 and is also now available for purchase. This report presents the latest TFI forecasts covering switching, circuit equipment, metallic cable, and fiber cable. The report also includes TFI's latest recommendations on depreciation lives for local exchange telephone plant, recommendations which take into account technology displacement and loss of access lines due to competition. The metro transport network is comprised of the transmission facilities that connect incumbent local exchange carriers (ILECs) central offices to each other. Today?s metro transport network is provided almost exclusively over fiber optic cable running between central offices. 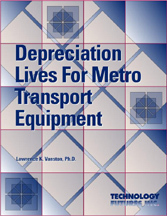 This report discusses several major changes impacting the metro transport network and recommends useful depreciation lives for metro transport equipment. TFI announces the availability of the fourth edition of its flagship publication Transforming the Local Exchange Network. This report presents the latest TFI forecasts covering switching, circuit equipment, metallic cable, and fiber cable. The report also includes TFI's latest recommendations on depreciation lives for local exchange telephone plant, recommendations which take into account technology displacement and loss of access lines due to competition. Technology Futures forecasts continued increases in broadband speeds, hastening the obsolescence of broadband investment. This report presents recommendations for depreciation lives for broadband equipment such as video set-top boxes, headend equipment, and broadband loop electronics, including DSLAMs, DSL modems, and BPON equipment. 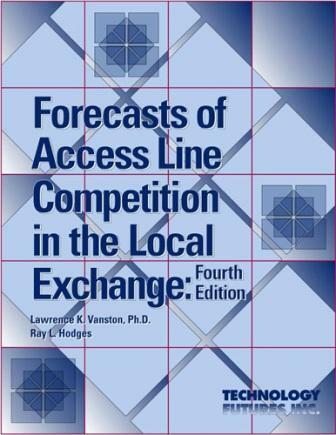 Discussing the report, author Dr. Lawrence Vanston states, "The business of incumbent local exchange carriers (ILECs) is transitioning from primarily voice to primarily high-speed broadband and video. This means that equipment devoted to delivering broadband and video will come to dominate the useful investment of ILECs. Much of this equipment is significantly different than traditional narrowband equipment and, thus, may have different depreciation lives." Mechatronics is another way of saying "intelligent mechanical systems" and it is the foundation of many 21st century enabling technologies. This publication, co-authored by Technology Futures' staff, includes an overview of mechatronic technology and analysis of related occupations and salaries, inventory of existing mechatronic curriculum and considerations for colleges considering developing related programs and lists of industry experts and mechatronics companies. Download Complimentary Electronic Version of Report. Technology Futures predicts wireless broadband can be economically deployed on a reasonably large scale--perhaps 20% of households--to offer the types of broadband services that DSL and cable modems offer now: that is, speeds in the range 1 Mb/s and relatively bursty traffic. This report provides an independent assessment of the potential for wireless broadband to compete with residential broadband services offered by incumbent local exchange carriers (ILECs) and cable companies. The market for integrating digital technology into residences is expanding beyond large, custom-built homes and into the broader mass housing market. The home technology integration (HTI) sector includes audio, video, networking, control systems, air conditioning, security and computer technology. This publication, co-authored by Technology Futures' staff, includes an overview of HTI technology, the nature of HTI jobs and skills, a directory of many HTI companies, and market drivers and constraints impacting the HTI industry and employment. A must-have report for individuals and small and medium-sized businesses interested in entering or expanding activities in the biotechnology industry. The report gives a detailed overview and analysis of employment opportunities, drivers for success, funding sources, potential buyers and sellers, and research and commercialization opportunities. It includes direct input from experts currently working in the biotech area. The latest edition of this report presents the latest Technology Futures' forecasts for the North American local exchange network covering switching, circuit equipment, and outside plant. The report also includes Technology Futures' latest recommendations on depreciation lives for local exchange telephone plants, accounting for technology displacement, and loss of access lines due to competition. Forecasts for Broadband Communications: An Analyst Paper by Technology Futures, Inc.
We expect broadband to continue to be adopted at a rapid rate, and ultimately, reach levels of penetration comparable to other popular consumer electronics. This paper provides Technology Futures' forecasts and analyses for the growth of residential broadband and higher broadband speeds. Technology Futures identifies four emerging technologies worthy of detailed analysis, and found three offered promising opportunities for college graduates. A portion of the report focuses primarily on educational activities in Texas community and technical colleges, while the remainder is a resource for a broader-based audience. The report is housed on the TSTC website. This report, written by Technology Futures staff members, offers information, insights and forecasts for those interested in homeland security. A portion of the report focuses primarily Texas community and technical colleges and homeland security activities in Texas. The remainder is a resource for a broader-based audience. Competition is having a major impact on incumbent local exchange carriers (ILECs). For example, after years of high growth, the number of ILEC retail narrowband switched access lines peaked at 181.3 million lines in 1999 and has continuously declined since then, falling to 162.7 million lines by December 2002. This report documents Technology Futures' latest forecasts of the future of competition in the local exchange and its impact on the ILECs. The report addresses the state of the art in fuel cells, the nature and rate of technical advances, potential employment demands, and forecasts and insights on the future of fuel cells. A portion of the report focuses primarily on two-year Texas colleges and fuel cell activities in Texas, the remainder is a resource for a broader-based audience. This report addresses the current state of the technology, projects the emergence of nanotechnology markets, and examines the factors that might accelerate or deter the development of these markets. The first part of the report focuses on two-year colleges in Texas, the remainder lends itself as a resource to a broader-based audience. Technology Futures has developed a new process, Programs for Emerging Technologies, in coordination with the Texas State Technical Colleges (TSTC) System, for identifying emerging technologies and then forecasting associated technical advances, market developments, and employment opportunities. It's 2015. Where are we in the LE telecom technology arena? What are broadband data rates? What's the impact of wireless? What's the network architecture? 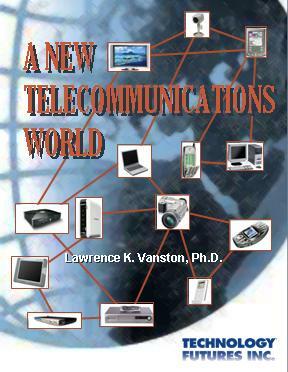 Viewed from the perspective of 2001, find out author Larry Vanston's scenario backed up his extensive expertise and Technology Futures' technology forecasts! Find out more about 2015 to better prepare for the future! This report provides a comprehensive review of salvage and cost of removal factors for the local exchange carriers. It analyzes recent salvage trends and issues for computers, circuit switching, and outside plant investments, including non-metallic cable, poles, and conduit. It provides an identification and assessment of potential changes in salvage and cost of removal factors due to current and future technology trends. ForeWord Reviews’ Book of Year Award Finalist!